Griff, who is 8, has been taking more and more stuff up into his bunk. We don't nitpick this habit because it's his space and he loves reading for an hour before going to sleep, but when we went to strip his sheets the other day and discovered that in addition to 8-10 assorted books, he also had a box set of Little House Books, his diary, a tattered sudoku collection, several stuffed animals, his reading light, assorted pens and pencils, and a chess set...well, it was time to find a top bunk storage solution. Not just talk about it, as we've done for a year or so, but actually DO IT. We had a mom-and-son date at Target today, where I led him through every conceivable area of the store that has organization/storage items. Office supplies, home improvement, bath caddies, baby gear organizers, laundry baskets, and on and on. He wasn't keen on my idea of hanging a canvas closet organizer horizontally, but he loved the shower caddy. Not my first pick, but the idea was to find things we could hang from a picture rail. He wanted two, and I discussed the price of one with him. He was suitably impressed by the expense and agreed to limit it to one. It seemed like we wouldn't find something we could use for bookshelves and larger toy storage, so I asked him what he had envisioned. He said he wanted baskets. I had been picturing horizontal storage, while he had been picturing bins! We found baskets - again discussing the cost and the importance of treating them with care - and once we were actually hanging them, I realized they could work in both orientations, so he decided to have one of each. 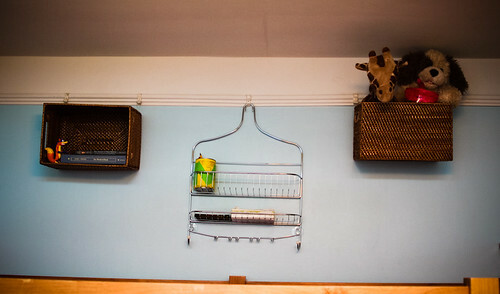 The caddy is hung from a hook off the picture rail. I wove wire into the baskets and hung them from two hooks each. It's not gorgeous (the baskets are OK but the caddy...oy), but it's tidy, and better yet, Griff was part of choosing the solution. Everything fits perfectly. Well, I asked him not to keep the chess set up there. But he's got all the other things he loves, without crowding himself out of his bed. 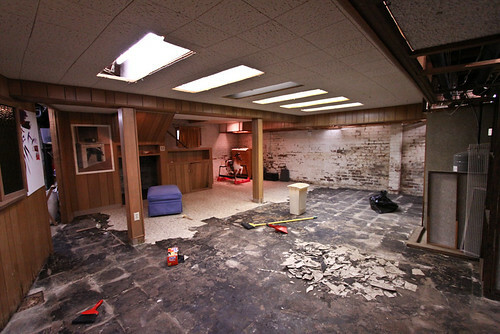 The basement is 80 years old. The flooring and wood paneling? I'd guess somewhere between 40 and 50 years old. Somebody partially-finished it - and I do mean partially - in the 60s or 70s, and since then it has seen flooding and humidity and several thousand generations of spider crickets. I eventually see this space being refinished - the wall torn down, the ceiling finished with recessed lighting, some closets and cabinets built, nicer flooring. NO peeling paint, NO dust sifting down from the floorboards above, NO wood paneling, and certainly NO bugs hanging out all over the place. Dan wants an entertainment center down here but I'm not sure the space will ever really work for that. It will work as a kid hang-out, complete with the drum kit we recently bought at a yard sale ($80! ), inevitable future drum kits, some big ol' couches, a game table. For now I'd just like to get things cleaned up so we can throw down some all-weather rugs and move some shelving and toys down here. The kids love playing here but there's nowhere nice to put anything and honestly, the chipped-to-hell floor is disgusting. You can't really wash it, it's that bad. I hosed everything down last summer (freaking out the house alarm in the process, apparently it's hooked up to the CO detector and the detector went haywire from all the humidity) and scrubbed with Dr. Bronner's and a push broom. Ugh. It took forever to dry because water got under the tile. In fact, I'm not sure it ever totally dried. Gross. In a manic fit, the boys and I started tearing up tile last week, taking advantage of decades-dried glue by popping off pieces easily with little more than a putty knife. Pop, crack, scrape, half the floor was done. Woohoo! We'll be scrubbing and painting in no time! My estimate was that the whole tear-up job should take 4 hours or so. Attacking the second half of the job, I discovered that the tile was glued down more securely than the rest AND that the same area was double-layered. WTF? No more popping off of whole tiles. Putty knives became chisels, paired with rubber mallets. Tiny chunks of tile-and-glue sandwich came up. My thumbs blistered. My wrists ached. The kids lost interest. An easy weekend job ended up abandoned for another weekend, sometime after better tools could be obtained and carpel tunnel inflammation calmed down. I'm almost ready. In the meantime, it stinks down there. It would appear that some moisture can come up through the cement floor (a possibility we knew existed), and with more floor exposed, the air is more humid, and it's nasty. Dan can hardly go down there, and I don't really like going down there, which means our laundry efficiency is greatly reduced. With any luck, better chisels will be purchased soon, the floor will be scraped and scrapped and scrubbed, and then we can get down to the job of sealing everything up with super-duper paint and decorating. I'd really like to be on the other side of that project RIGHT NOW, enjoying a drum solo and a Lego table from the comfort of a yard sale Papasan or somesuch. If you wanna help, there might be a beer and a turn at the drums for you, too. 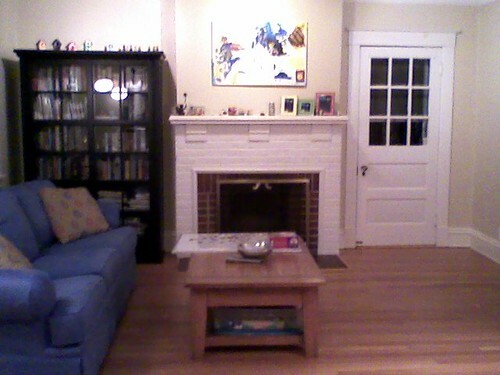 Finally, after nearly two years of living here, the living room has a fresh coat of paint. What a difference it makes! Not that you can see it in this grainy cell phone photo. 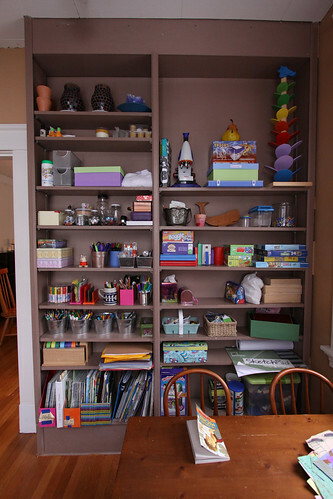 You'll just have to trust me, a little neutral color on the walls and a kid-painted canvas is a great change. The only thing that feels better is the sense of productivity: the kids and Dan have been gone since Wednesday and I have painted the kitchen, downstairs hall, foyer, and living room and had time to get my hair cut, a massage, pedicure, brow wax, go out to dinner one night, and entertain friends at home another. Perfect at-home vacation! Somebody is sure to say I'm overthinking this, but here goes. After all, I don't believe there's any such thing as overthinking, and sometimes something requires a lot of thought to noodle it through. So: I am in possession of two souvenir tiki pieces, a giant spoon and fork, that hung on my grandparents' wall as long as I can remember. They were a source of awe and delight to me as a child and a source of comfort - of the everything-stays-the-same-here variety - as I got older. And now they live with me. They have perched on top of door frames in my kitchen for a couple of years but I keep considering what else I could do with them. Part of me wants to hang them in the dining room. I love their kitschiness, I love the memories associated with them. But part of me thinks their kitsch power resides in something more sinister: an exploitative, racist view of "natives" of other places. The mere fact that I feel uneasy about having them displayed in my home tells me that I need to explore this. Many of us grew up hearing casually racist statements from grandparents and just-as-casual "their generation didn't know better" excuses from our parents. That implies, somehow, that our generation does know better. And if we know better, we ought to do better, right? I generally stay away from design that relies on cultural exploitation. While I love the look and symbolism of prayer flags, because I am not a Tibetan Buddhist, I do not fly them at my own home. I don't decorate with foreign language symbols if I do not have the ability to read them. When I see a decorative item from another culture, I ask myself, why do I like this? What would this item mean to somebody from this culture? Would I be trivializing that by having it in my own home? I extend this to other practices, as well - for example, I do not call celebrations of pregnancy "blessingways" because I am aware of the significance of the word and original ceremony to Diné people, and when I host a mother-blessing, I draw from spiritual practices important to me, rather than borrowing "native American" traditions. 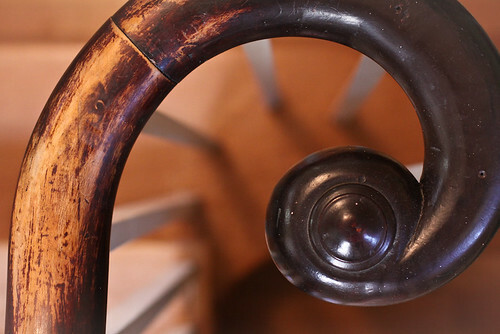 While it is true that cultures have always borrowed from each other, it's important to me to consider how the members of the borrowed-from culture feel about the borrowing. Is it borrowing, or is it stealing? When discussing cultural appropriation, people often get caught up in the belief that all cultures borrow from each other and that because this happens, it is inevitable, and perhaps not worth examining. One thing they fail to identify is that generally, cultural assimilation occurs as a raiding of a minority culture by a dominant culture, and that this assimilation is different from other methods of cultural syncretism. Syncretism is the merging or union of two things in useful ways, such as the development of a pigeon language, the spread of slang words, and the adoption of new dietary habits when one culture is exposed to another. Syncretism is not the collection of items as interesting kitsch. Being inspired by the Navajo practice of a gathering of women to celebrate pregnancy would be an example of cultural syncretism, especially if the inspired person feels a need for this sort of community practice and lacks it in her own life. Copying specific Navajo rites and using their language/phrasing is cultural appropriation. Appropriation is certainly one route of cultural syncretism, but it operates via raiding a non-dominant culture and taking its elements out of context. Because of the colonialist aspect (dominant culture raiding non-dominant culture), there is a power imbalance, which makes appropriation exploitative. The tiki spoons represent an era in which Polynesian cultures were considered exotic. I'm sure the experiences of World War II veterans who had been stationed in the South Pacific served to heighten awareness of the cultures there and supported an attraction to and curiosity about these places. The musical South Pacific (long a favorite of mine; I owe my marriage to an audition performance of "My Honey Bun") highlights both the kitsch factor of Melanesian culture and the racist tensions underlying American interactions with natives there. Frolicking in grass skirts: fun! Deeper understanding of islanders as humans: difficult. Tiki items were (and are) shorthand for carefree island living, novel flora and fauna, vibrant color, strange new flavors. They are not useful items or practices being adopted (syncretized) by another culture. Kitsch is appropriation for decoration's sake. Kitsch is the flotsam on the surface of a culture. It's easy to scoop up and take home. It provides a snapshot of the things that struck you - but like first impressions, these souvenirs may not be an accurate representation of the people who produced them. It's easy for us to lay back on our surface impressions, and it's easy for souvenir shops to cater to them. It's easy for us to use them as shorthand for our hipness, our eclecticism, whether we're selling a cookbook (like Sophia, above) or decorating our kitchens (like my grandparents, and now me). I'm not sure whether these spoons came from a department store or a Hawaiian vacation. The latter certainly seems possible. Magdalena Georgieva suggests that the thought behind a souvenir purchase - decoration or treasured memory? - is the difference between cultural appropriation via souvenir and acceptable collection of native art. I'm not sure sure. Liking something, even having warm fuzzy feelings about it, doesn't make its use any less an act of exploitation. Especially if that thing was created specifically for tourists, as is almost certainly the case of my giant fork and spoon. I feel fairly comfortable saying that the tiki dinnerware represents a form of cultural appropriation. What I'm less comfortable with is what to do about it. If I were facing these items in a store, the solution would be simple: don't buy them. But what to do when the items represent not only a culturally sticky situation, but also a treasured part of family history? And how would my response be different if the items in question were less geographically and culturally foreign to me - like, for example, a "mammy" cookie jar, or a piece of "art" bearing stereotyped Chinese cartoon figures. 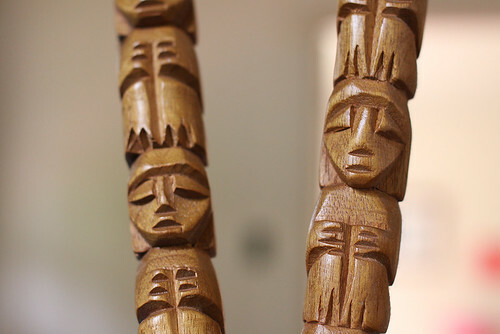 Because I don't know about the culture who created the tiki pieces, and I don't know the circumstances under which they were created and purchased, I'm not completely sure what they represent. Or am I? I'm pretty sure nobody was ever planning to eat with them. I'm fairly confident that they were carved to look like a Westerner's impression of Polynesian art and that they are fairly poor representations of authentic Polynesian culture. What does it say to my children and to my guests if I hang them on the wall? Yet I still get hung up on my own fondness of these items and, at the same time, a desire not to be wasteful - after all, where do the mammies and tikis go if we don't display them? Do we let them rot in attics? Set them free in thrift shops so that other people's guests and children are exposed to them? Do we (cringe) destroy them? Is there any amount of warm fuzzy memories that can polish away a patina of cultural exploitation? Once colonialism appropriates an object, can it ever be set free? I'm not much of an interior decorator, and a perfectly-appointed mantlepiece is never going to happen in my house. Instead, we have a hodge-podge of items that have been deemed worthy of this place of honor. A gnome. A key. 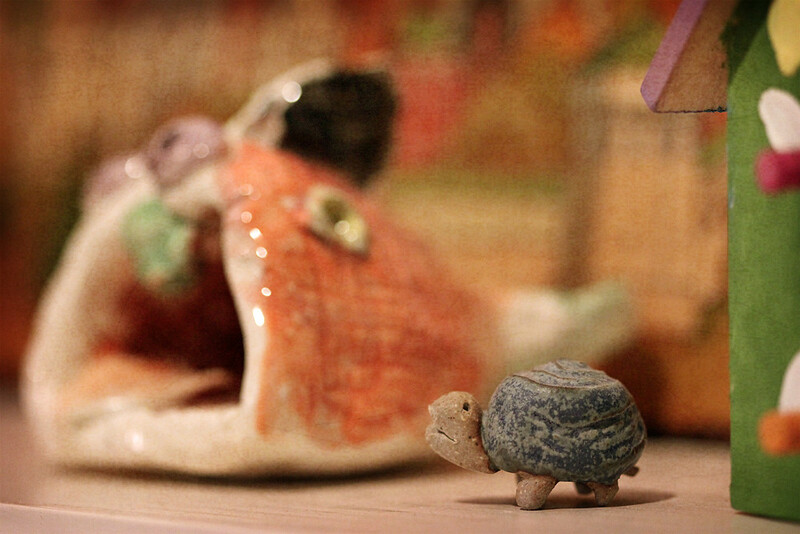 A tiny ceramic turtle. Four hand-painted miniature birdhouses. Assorted candles in mismatched clear glass containers. An antique squirrel. One vintage tin that contains small, kind offerings. A card from a friend. A wooden toy. A forged leaf. A clay fish monster thing. A rock, a heart-shaped polka-dot rock-like thing, a pebble picked up by a boy. And sometimes a sheep and a chicken. This, boys and girls, is why I NEVER blow-dry my hair in the morning and rarely put makeup on. In fact, I discovered during the past year that I can really skip showering every other day without my hair looking nasty. My kids wake up before I do and I'm not willing to set the alarm for 5:30 AM so that I can shower and primp in peace. Today, unfortunately, I needed to look semi-presentable for a morning meeting at which I would be photographed, and took the time to break out the hair dryer. I went back downstairs to discover a foyer redecorated in a Clifford Crunch theme and a design consultation session taking place in the kitchen - which apparently required that every. single. kitchen gadget be emptied out of the drawer onto the floor. Perhaps unsurprisingly, I did not pay the decorator for his work. Aesthetically, I hate it. Practically, I adore it. I bought this chunky, oversized coffee table six years ago. It fit my suburban home, but more importantly, it fit my future. One son old already enough to dance on tables. More kids joining his dance party in the future. 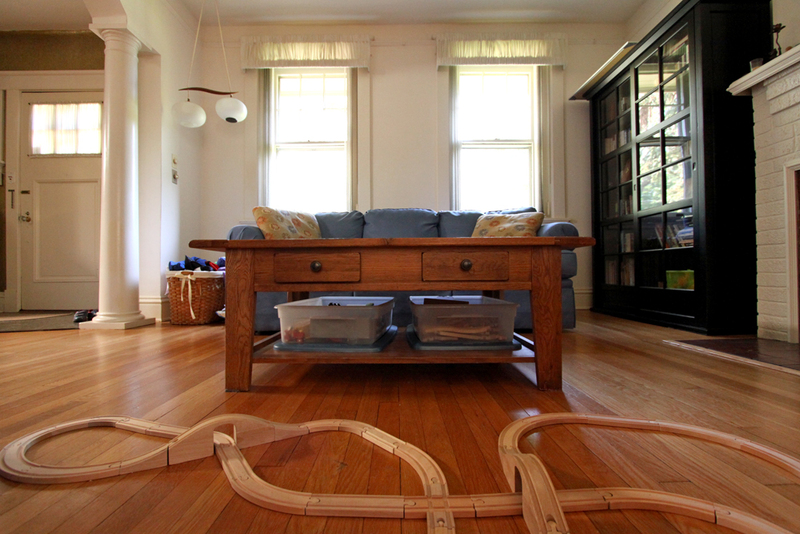 I wanted toy storage and train table by day, TV snack surface by night. It's really too big for our new (old) house in town, but its rugged build is still an absolute necessity. Someday I'll commission my brother to build something with more elegant proportions...and I'll put some paint on the walls...and hang some pictures. Until then, practicality R us. Day 3 without Dan, we're back to the weekly schedule, but this whole lack of another parent is starting to wear on us. Xander keeps crying for Daddy and I'm feeling frazzled. Good thing he comes home tomorrow. 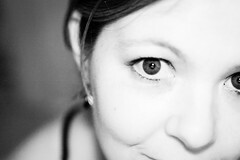 I didn't want to touch the camera today, but forced myself to just pick it up and snap something. This paint patch that I did today was right in front of me. 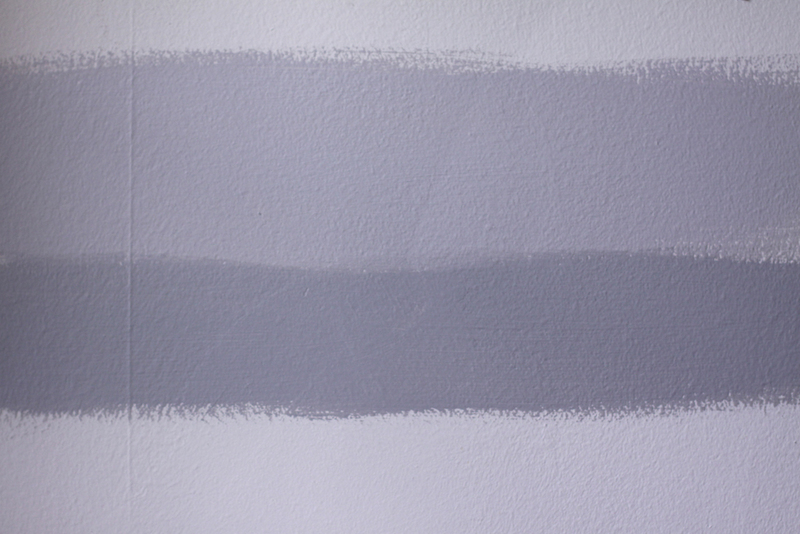 Amazing how it takes me nearly two years to come up with two shades of grey to test on my bedroom wall. Some days, just smearing a square foot with paint and pushing the shutter button is all you can expect of yourself. Funny thing is, I rather like it, and I think I've picked a color. Nice how readjusting expectations works for you, sometimes. A friend was so inspired by our studio that she made one of her own! This, in turn, inspired me to do a little overhaul of our shelves. About a quarter of the space had been overrun with an excess of games and puzzles. Griff and I went through all of them, chose which to donate and which to keep, and then found new homes for the keepers. In the meantime, Reese and Dan played several of them. 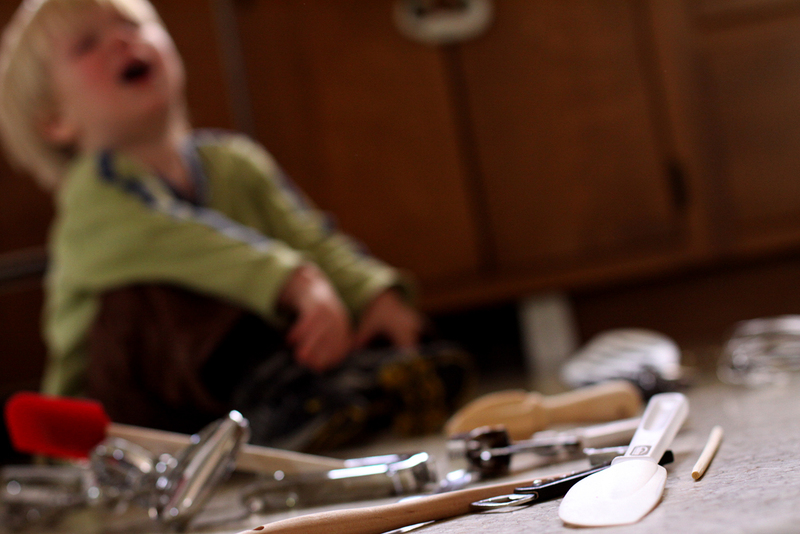 I love how shuffling things reminds us of what we have and encourages us to make use of them! Above is the end result of today's rehab. Ahhh, so much better. A couple of people have asked about our art studio in the past; if you want to know what's on those shelves or see more views of the studio, click through to the flickr page for the labeled image, and then scroll through a couple more shots of this space. The room is far from finished - it needs new shades to replace the dry-rotted orange ones, the shelves need paint, and one wall is bare, waiting for me to decide what kind of art display system to install. It's still our favorite spot, though. I completely agree with Patience that sacred spaces are essential. This room was beloved by the previous owners of our home; they used it as an office and reading nook. I had originally intended to do the same (minus the wall-to-wall carpet and heavy paisley), but then realized how perfect the shelves would be for holding the buckets of art supplies that had been heaped in a kitchen cabinet in our old home, and how lovely the room would be with the kids' little table and a love seat. It was an instant hit and during our first few months here, we ate breakfast every morning at the little table and the kids made drawing after drawing while I read books on the love seat. The seat has since moved to the living room and our kitchen set has moved in, but the room is still the busiest in our home. It's full of light and creativity. The sun streams in through "stained glass" coloring book pages taped up by Griff and fused glass tiles made by me. A narcissus slowly grows up inside the window and birds visit our feeders outside of it. Just past the birds we can see the whole wonderful back yard, and in the summer people inside the house can call to those outside through breezy open windows. This space is the heart of our home, it represents all the things we love most about ourselves and the place where we live.